AGAPITUS I, elected the fifty-seventh Pope of Rome on 13th May 535, and reposed on 22nd April, 536. St. Agapitus was a staunch opponent of Monophysitism, and though his pontificate was brief, he managed to have the Monophysite Patriarch of Constantinople Anthimus deposed (536) and for St. Mennas (25th August) to succeed him. ARWALD, Arwald was a prince in the Isle of Wight whose two sons were put to death by soldiers of the then — Pagan King Cædwalla (later King St. Cædwalla 20th April) on the day after their baptism in 686. As there is no longer a record of their names extant, they are known by the name of their father. The limited information that is known is from St. Bede the Venerable (25th May) who, in his Historia Ecclesiastica , documented these few details. CAIUS (GAIUS, CAIVS), there is no reliable information about his early life, though there is a legend which states he was a native of the Dalmatia region of present-day Croatia, related to the Emperor Diocletian (r. 284–305), and the uncle of St. Susanna (11th August). St. Gaius was elected the twenty-eighth Pope of Rome in December 283, originally said to have been martyred with members of his family in 296, however, there now is uncertainty as to the accuracy of this account. EPIPODIUS and ALEXANDER, two young friends in Lyons (east-central France) who dedicated their lives to serving Christ. in 178, during the persecutions under Emperor Marcus Aurelius (r. 161–180), they were arrested, tortured, and martyred. St. Alexander and companions are also commemorated on 24th April. LEO of SENS, consecrated the sixteenth or seventeenth Bishop of Sens (north-central France) circa 518. St. Leo served his See for twenty-three years until his repose in 541. OPPORTUNA, the sister of St. Chrodegang (6th March), Bishop of Séez (Normandy, France). While still quite young she received monastic tonsure from her brother and entered the convent called Monasteriolum (little monastery) near Almenèches (north-western France), around which the village of Montreuil-la-Cambe grew. In later life St. Opportuna was elected Abbess of the community, serving until her repose circa 770. 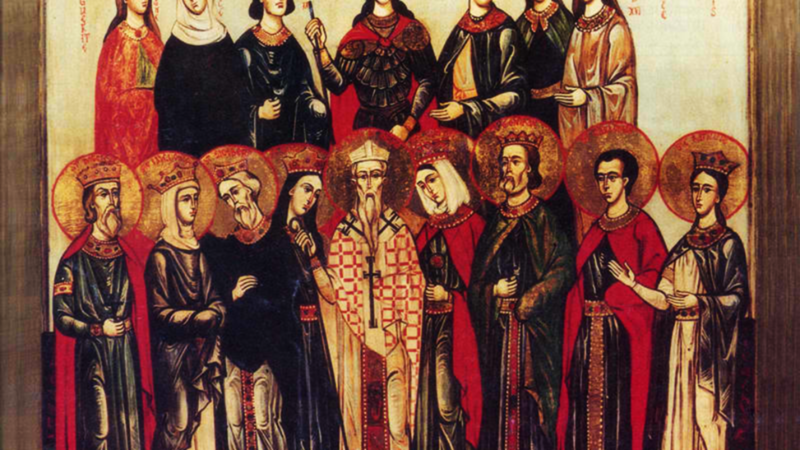 SENORINA, a daughter of nobility and relative of St. Rudesind of Mondoñedo (1st March), St. Senorina was raised by her aunt Godina, Abbess of the monastery of St. John in present-day Vieira do Minho, Portugal. She later received monastic tonsure, and eventually succeeded her aunt as Abbess. While Abbess, St. Senorina relocated the monastery to the village of Basto 21 km / 13 mi to the south-east of Vieira do Minho. St. Senorina reposed circa 982. SOTER, the twelfth Pope of Rome (162 or 168 – 170 or 177). Nothing of his life prior to becoming Pope, and little is known of his pontificate. According to tradition St. Soter was martyred, however, there is no documentation extant which supports this.